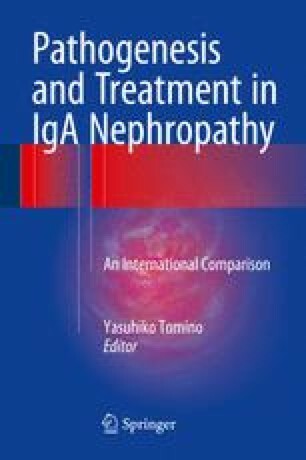 IgA nephropathy (IgAN) accounts for 45 % of the primary glomerulonephritis in China. The 10- and 20-year cumulative renal survival rates were 83 % and 64 %, respectively, in a cohort of 1,155 Chinese patients with IgAN. The levels of estimated glomerular filtration rate (eGFR), proteinuria, hypoproteinemia, hypertension and hyperuricemia are the five most important clinical risk factors independently associated with renal outcome. Pathologically, the lesions of mesangial proliferation and tubular interstitial fibrosis correlated independently with prognosis of patients with IgAN. IgAN patients with minimal change disease and those with recurrent macro-hematuria are considered distinct subtypes of IgAN and have a relatively favorable renal prognosis. Using repeat renal biopsy data, we found that active proliferative lesions (glomerular endocapillary hypercellularity, crescent, or necrosis) are reversible after immunosuppressive treatment. The renal pathological lesion-based guidance for treatment options provides new tools for individual therapy in IgAN patients.